I’ve become more and more obsessed with organic and natural beauty products. I honestly never use to pay much attention to them but it seems to be the way beauty is going, and with good reason! So naturally, I’m sent more natural and organic beauty products to try out for my blog. As I’ve been using them more frequently, and skincare products containing chemicals less often, I have really started to notice a difference. My skin just seems happier when I use natural products. It seems to breathe better, I experience less acne, it feels softer and more supple, and seems to have a nice healthy glow to it as well! I’ve recently been trying out some awesome hair, body, and skincare products from Nature Sustained, and have fallen in love with everything I’ve tried from them so far! Their products are 100% natural and raw and made using only plant-based ingredients. They contain no chemicals and are also gluten and cruelty-free as well! 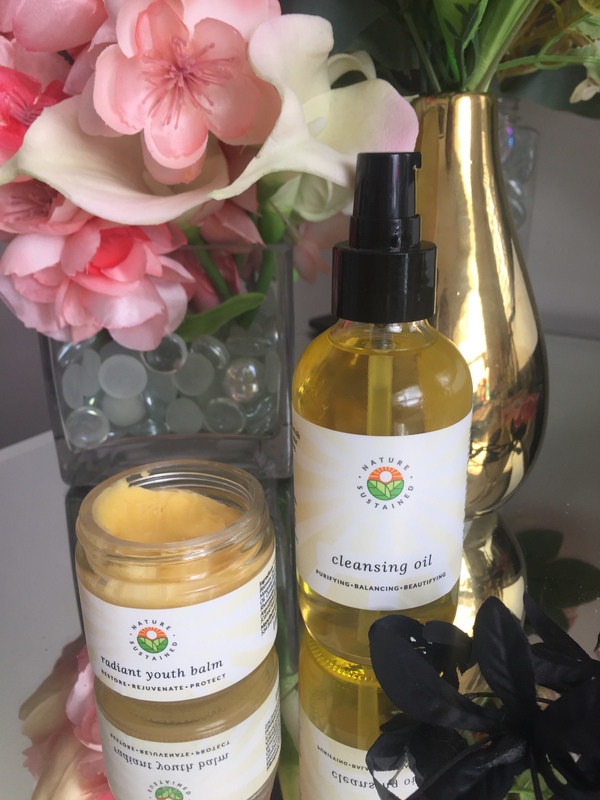 I got to try out the fabulous new Nature Sustained Organic Facial Cleansing Oil and Nature Sustained Radiant Youth Balm Facial Moisturizer for Oily, sensitive skin, and my skin has seemed to love these products as much as I have! Both of these innovative organic products are super hydrating. Even though the retinol moisturizing balm is especially great for those with oily, sensitive skin, both products work great for all skin types, including for my dry skin! The products are both safe and effective, and although powerful and great for making skin look and feel more youthful (both lessen the appearance of wrinkles, fade sun posts, and fight free radical damage, cellular, and molecular damage to skin) they’re both extremely gentle too! In fact, they have anti-inflammatory products so they soothe and calm skin naturally, thanks to including ingredients such as lavender, ylang-ylang, argan and jojoba oil. In fact, every natural ingredient used in these products are listed right there on the bottle, so you can see exactly what you’re getting! These products are also a good size and a little amount of each goes a long way, so you’ll really get your money’s worth because not only will they work wonders for your skin, but will last an incredibly long time too! Interested in trying out some of this fabulous skincare product for yourself? Shop Nature Sustained Here on Amazon today! Want to see more awesome Nature Sustained Beauty products? 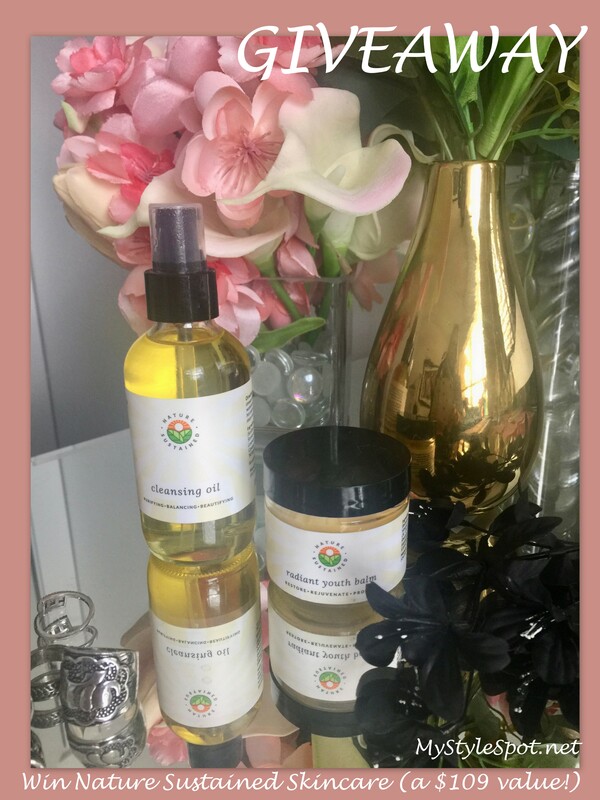 Check out my review here on some of their lovely raw hair and body wash products! Also, the lovely people of Nature Sustained are letting me GIVEAWAY both of these amazing products to one of my lovely readers! The Radiant Youth Balm sounds really marvelous. My Mother has very sensitive skin and it’s definitely something I’d want her to try. The cleansing oil for sure! Ohhh, do I have to choose just one I am excited to try? I honestly feel equally excited to try both. Skincare has always been important to me and now that my 50th birthday is only 2 months away, it’s on my mind and higher on my priority list even more than before! haha. I really want to try the Radiant Youth Balm. Im most excited for the youth balm!! It sounds amazing and perfect for my skin type! I really want to try the cleansing oil. I would love to try the moisturizer! I love the radiant youth balm. another product I would love to try from their line is the Raw Hair Conditioner for damaged hair. Radiant Youth Balm sounds so amazing to use love to try them all my skin is so dry right now.